When was Superman created? It all began with two aspiring comic book writers/artists Jerry Siegel and Joe Shuster. This is not a story of overnight success, rather it’s the history of a process, and of pure determination to succeed. Superman can trace his origin back to January 1933, when the two friends wrote and illustrated a short story, which Seigel published in his fanzine Science Fiction, titled “The Reign Of The Superman” it tells the story of vagrant who through the use of an experimental drug, gains incredible physic abilities which he then uses for his own selfish benefits and whims. He later loses said abilities and returns to the life of a vagrant, and regrets the misuse of his powers as now he will only be remembered as a villain. The story wasn’t well received and the pair turned their focus to comic strips which they self published in Popular Comics, with eventual goal of being syndicated in newspapers. 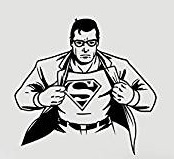 Seigel decided to reinvent the concept, and in 1933/34 he created a new fictional character called Superman, who possessed no special powers, dressed in regular clothes and was now heroic rather than villainous. After sharing the idea with artist Joe Shuster, it became an illustrated comic titled The Superman, they approached Humour Publishing who ran a strip called Detective Dan and although there were expression of interests no deal could be made. After many rejections Seigel dissolved his partnership with Joe Shuster, citing Shuster’s youth and relative inexperience as the reason, but Shuster was incensed and burnt their comic The Superman, with only the cover being spared. Seigel contacted more well know artists and eventually paired with Russel Keaton 1934, who had worked on the comic Buck Rogers. Together the two of them evolved the concept of Superman into something that is very close to the story we know today, but yet is subtlety different. With Keaton’s help Superman is transformed into the son of Earth’s last remaining survivor, who in the far distant future with the planet on the verge of a cataclysmic explosion sends his son back to 1935 where he is found and adopted by Sam and Molly Kent, who name the boy Clark. When they discover his superhuman strength and bulletproof skin, they tell him that must use his powers for good. Although the Superman concept now bears little resemblance to it’s earlier incarnation, it is still rejected by newspaper syndicates and Keaton leaves. And with that Seigel and Shuster mend bridges and continue working on the concept. Superman become an alien from the planet Krypton, and wears a costume emblazoned with an ‘S’ on it, and a cape. They also give him the shy and timid journalistic alter ego Clark Kent, who works along Lois Lane, who is in love with powerful Superman and is oblivious to his secret identity Clark Kent. In 1935 the two finally become comic professionals, working for National Allied Publications, during this time they continue to peddle Superman to interested parties to little avail. Finally Max Gaines suggested they show the strip to Detective Comics who had just bought out National Allied. Finally they had a buyer, but there was a catch, Detective Comics only published comics to which they had the rights. Feeling that this was only way Superman would ever be published they sold the rights for $130 (which would be $2200 adjusted for inflation) and in 1938 in Action Comics #1, a legend was born and history was made as Superman made his debut appearance. Although they sold the rights for a mere pittance at the time both the Siegel and Shuster estates would in time receive a massive amount of financial remuneration worth millions due to lawsuits and contracts with DC, so their early persistence certainly paid off, for them and their heirs as both of them are deceased but their families continue to benefit from their work. Where was superman born? The man of steelwas born on the planet Krypton, a distant world orbiting a red sun, inhabited by aliens who resemble humans but were far more technologically advanced, knowing that their planet was facing imminent catastrophe and unable to persuade the planet’s governing body of the impending disaster, Krptonian scientist Jor-El and his wife Lara placed their newborn infant son Kal-El into spaceship and launched him into the cosmos. They programmed the spaceship to take him to Earth, a world full of a less advanced race similar in appearance to Krytonians themselves. Earth orbited a yellow sun, whose radiation would give their child incredible abilities, powers that he would need to survive alone on his new home. Kal-El’s spaceship crash landed in a field outside of Smallville, Kansas, United States of America, and he was found by Jonathon and Martha Kent. Knowing of his otherworldly origins and fearing what the authorities may do if they became aware of his existence and being childless themselves they decided to adopt the boy and raise him as their own naming him Clark Kent, as Clark was Martha’s maiden name. As Clark grew up it becomes increasingly obvious that he was different, very different. As his powers evolved the Kent’s taught Clark to use them for good. Clark eventually left the farm to live his own life, he took a job in metropolis as a reporter, in this guise Clark affected a mild mannered, bespectacled alter ego, that went out his way to avoid trouble. It’s at this time that Clark revealed his true self to the world, wearing blue tights with red cape and boots, Superman is at last revealed to the world. 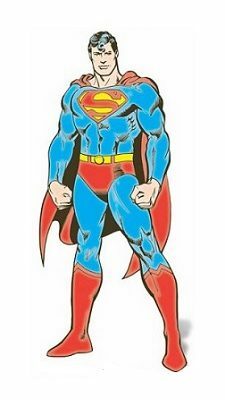 Superman is nigh invulnerable, has the ability to fly, super speed, super human strength, super hearing, has heat vision and X-ray vision. The source of these powers is our yellow sun, his Kryptonian body cells absorb our sun’s yellow radiation and store it giving him these abilities here on Earth(but which explains why the Kryptonians were not able to save themselves, as their planet Krypton orbited a red sun. Bit of bad luck there). He has three notable weaknesses the first being that he cannot use his X-ray vision to see through lead, the second is that he can be harmed by the mineral known as Kryptonite, which is actually debris from his destroyed home planet Krypton. Kryptonite comes in many variations, with green kryptonite being especially dangerous to the man of steel, as exposure will drain his powers, and prolonged exposure will eventually kill him. 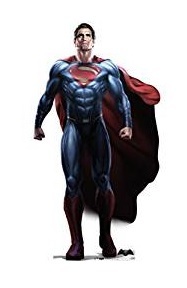 And finally Superman is one of the physically strongest beings in the DC Universe and is a match for most foes in a straight up conflict but he is vulnerable to magic, and magical weapons such as Wonder Woman’s sword which has been shown to be able to penetrate Superman’s skin and in theory could be used to kill him. How much can superman lift? That is a really tricky question to answer because whilst his powers have remained more or less the same, their potency has been subject to much tampering. For example Superman used to be able to fly into deep outer space or even across galaxies, but that was later reduced to the fact that superman could fly in space only as long as he can hold his breath. Which again changed to Superman once again being capable of prolonged space flight. Another power that is subject to constant change, is his strength, at one point he was able to move entire planets, this was drastically reduced to more mortal levels(albeit super powered mortals) but eventually creeped back up the point where he can hurl mountains again. The reason behind these editorial changes is not just whim, but due to fact that comic book writers were finding it increasingly harder to present serious challenges to the man of steel and seriously curtailed his powers so as to create more credible threats. 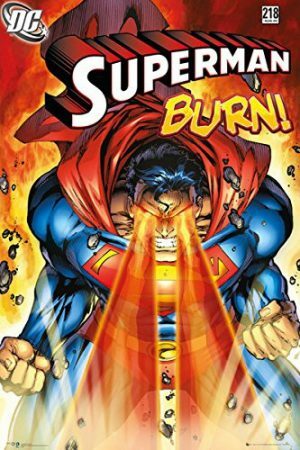 The writers of Superman’s latest attempt to make him more vulnerable is the introduction of a new superpower, notably an evolution of his heat vision, it seems that now when using his heat vision he can release all the yellow sun radiation in his body at once, completely obliterating anything in a quarter mile radius, the down side is that he will be completely drained of his powers and virtually mortal for a 24 hour period and whilst his body recharges by absorbing more solar radiation he will be vulnerable to forms of attacks that would kill regular people. This is a fairly new development and time will tell how it is received, or how long it lasts. As an aside it should be noted that the above paragraphs detail the Superman mythos as stands now, but his abilities and origins have always been an evolution through his history in comic and other mediums. For example in the earliest versions of Superman the Kent adopt him from an orphanage rather than find him in a field. Secondly in the earliest Superman stories he couldn’t fly he ran superfast and jumped huge distances, but in the early 1940’s when animating a cartoon the studio asked if they just have him fly, as it would make the animation process much easier, and incidentally also made it easier for the studios again when they produced a live action serial movie later that same decade. But Superman’s inability to fly is why you may remember that catchcry “able to leap tall buildings in a single bound”, because that’s how he was getting around in the early days. 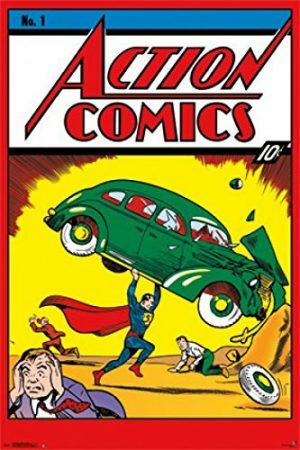 Since his comic book debut in 1938 Superman has appeared on tv and the in the movies and a wide variety of other mediums since his creation, firstly he appeared in a syndicated newspaper strip in 1939 in which jerry Siegel and Joe Shuster added more background details about the planet Krypton and Superman’s father Jor-El, which had not yet appeared in the comic books. He was then the basis for a long running radio serial titled The Adventures Of Superman which ran from 1940 to 1951. Between 1941 and 1943 there were 17 animated cartoons with some episodes budgeted for $50,000($814,000) which is incredible amount of money for the period. In 1948 The first movie titled Superman starring Kirk Alyn which was released as a 15 part serial. And then in 1951 the first feature film starring George Reeves it was called Superman And The Mole Men and was intended to set the premise for a television series Adventures Of Superman which ran from 1952 to 1958. Everyone wanted a piece of Superman and in 1966 there was a Broadway musical It’s A Bird…It’s A Plane…It’s Superman, which was remade in 1975 as a television special. Also in 1966, Superman appeared in a new animated television series The New Adventures of Superman. The man of steel returned to the big screen in 1978 with Christopher Reeve in Superman, the movie was huge hit and spawned three sequels(1980, 1983 and 1987)all starring Reeve, unfortunately both the script and production quality suffered as the movie series progressed and each sequel was more poorly received than it’s predecessor. In 2006 Brandon Routh appeared in Superman Returns which tried to reboot the franchise after it’s long hiatus, they story tried to pick up after Christopher Reeves second film and pretend that films Three and Four never happened. Unfortunately fans were not so eager forgive and forget, and there was also a certain of confusion about the continuity of the new film. Overall it was poor idea and was poorly received by fans. The next attempt to revive the ailing movie franchise was made in 2013 when Henry Cavill reprised the role in Man Of Steel the received mixed reviews from critics and fans alike, he would then go on to return to the role for it’s 2016 sequel Batman Vs Superman also starring Ben Affleck as Batman and Gal Gadot as Wonder Woman. Which unfortunately also received mixed reviews from fans and critics. It important to note that even though there have been extended periods of time when Superman has not appeared on the big screen he is usually appearing on the small screen in some form or another whether it’s ABC’s Super Friends series which ran from 1973 to 1986. Or whether he it was the hugely popular big budget television series Smallville which ran from 2001 to 20011 starring Tom Welling as Clark Kent and told the story of Superman’s adolescence and young adulthood and his discovering of his powers and how he should use them. He has also appeared in many other shows like the animated Young Justice(2011-2016), aswell as making appearances on the current television series Supergirl. Yes Superman is always with us in some form or another and is an integral part of American culture and identity, something that is unlikely to diminish in foreseeable future. All images featured on this page are available from Amazon, or to find out more information on other awesome superheroes at Superheroes Central.